Customers have been asking for a weedless version of the popular Poacher line-thru swimbait and now it's available. Fans of the Poacher will love adding a weedless option to their arsenal. The Weedless Poacher is going to shine when you need big action in a more compact yet bulky swimbait with tons of tail action and head wiggle. Perfect for fishing in and around hydrilla, coontail, pad stems, timber and any other cover you care to throw it into. Designed with a hook slot in the belly for rigging an 8/0 Owner Beast Swimbait hook. You can either go with the weighted version or if you are fishing super shallow or want an ultra slow presentation opt for the weightless 8/0 Beast and wrap a little lead tape around the belly of the hook to give it your desired sink rate. 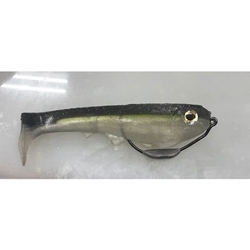 If you love the 7" Weedless Convict but have always wanted a similar style bait in the 5" range this is the bait for you.